SUICIDE BY A GUILLOTINE. An inquest has been held on the body of Francois Auguste Chere, aged thirty-eight, a French artisan, of New Cross Road, London, who committed suicide under the following circumstances —Mr John Wilson stated that the deceased had lodged with him twelve months, and was apparently independent when he took the apartments. He was very quiet and respectable, and spent the greater part of his time over some engineering models, in which he intended carrying out improvements. Latterly he seemed to be pressed for money, and a fortnight ago told witness that he was artisan who had saved money for the purpose of going into business, that his wife was killed during the bombardment of Paris five years ago, that his money was nearly gone, and that when he was penniless he should quit the world. A few days ago he brought home two large planks of wood and a large double-handled knife, such as is used by tanners for scraping the hair off skins, but no notice was taken of it, witness thinking they were for cutting up into models. Nothing was seen of him next day, and on the following morning his door was burst open, when it was discovered that he had committed suicide by cutting off his head with a guillotine. The two planks had been used as uprights, at the top of which the knife bad been placed. Grooves had been cut in the inner sides of the planks for the knife to run down easily, and two heavy stones were bound to the upper part of the knife to give it weight, and by means of the pulley he had drawn up the knife and let It fall on his throat, the head being cut clean off. Confirmatory evidence having been given, the jury returned a verdict of suicide whilst of unsound mind. A trawl through Google revealed a number of other suicides conducted with homemade guillotines; the phenomenon is more common than I realised. This form of suicide, which appears to be confined mainly to Northern Europe (England, France and Germany) and the United States, seems to have started in the mid 19th century and has continued up until today. 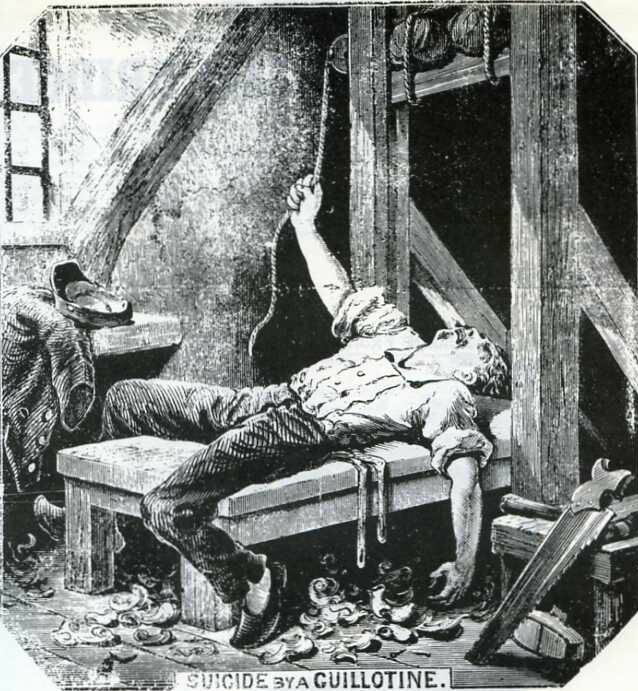 The most recent English suicide by DIY guillotine was of 36 year builder Boyd Taylor of Northumberland who spent three months building a guillotine in his bedroom before he killed himself with it. The 19th century French instances seem to have frequently made the front page of the Gallic equivalents of the Illustrated Police News, with depictions far more lurid than anything a British publisher have dared to put out. It is tempting to show you an example but this is The London Dead and not Les Morts de Paris and I have to draw the line somewhere.